Add some student imagination and easily gathered items and students can start investigating wheeled vehicles. This assortment of wheels come in a handy divided utility case. 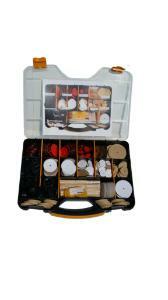 Items included are mdf wheels, plastic dragster wheels, card disk wheels, super wheels, and dowel to be used as axles. Students need to provide their own car chassis out of any household items - recyclables, wood or coroplast etc. Combine with other ENG box kits to expand the possibilities.